This chapter develops various approximate discrete-time models for general linear deterministic systems. 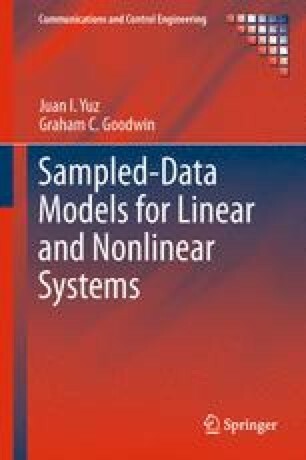 It is always possible to obtain an exact sampled models for linear systems. However, approximate models are treated here to provide insights into the structure of discrete-time models, to obtain simpler models, and to be able to construct similar approximate sampled models for nonlinear systems, later in the book. We present models based on simple Euler integration, on the inclusion of asymptotic sampling zeros, on up-sampling, on normal forms and on truncated Taylor series expansions.